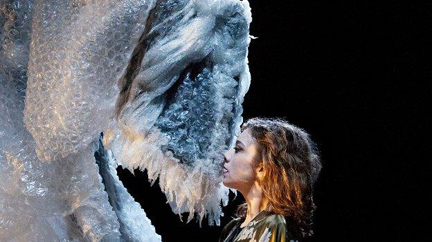 Some years ago, I had the privilege of seeing and reviewing Aurélia Thierrée’s first theatrical outing, Aurelia’s Oratorio at Lyric Hammersmith, at which time I was swept away by the charm, lyricism, playful skillfulness and offbeat wit of her show. A few words with Aurelia herself at the press party following and a gracious thank you from her via e-mail after, more or less promised I’d be rooting for her at her next show. Having seen and savoured the much praised show of her illustrious parents, circus practioners extraordinare, Victoria Thierrée Chaplin (daughter of late master clown/ film-maker Charlie Chaplin)and Jean Baptiste Thierrée, Le Cirque Invisible, twice in the interval between seeing her own shows, I understand where Aurelia’s dreamy sensibilities and inherent tendency to realize them onstage originated from. As with her parents show, to see Aurelia perform live is to believe that all she imagines onstage is, in some sense, real. Therein lays the art, as they say, and, the joy of watching her perform. It’s difficult to pinpoint just what type of act Aurelia stages as it blends aspects of dance, circus, mime, theatre and illusion, offering a unique mix that is all her own. I doubt whether I’ll pass a pair of long curtains dancing in a breeze in future without thinking of her, as her use of fabric and space via trapeze, ladder, balance beam, as hiding place or doorway to intrigue are genuinely dazzling and dangle viewers between the reality of the theatre she’s performing in and her own slightly mystifying realm of fantasy meets film noir. As is the case with many youth generated circus acts these days, the 1940’s of Casablanca and Bogie and Bacall is suggested through music, but, in Aurelia’s case, her elegantly swirling gowns and hair, which has a tendency to slip casually over one eye as she performs, as well. The unexpected dance she lapses into, seemingly unconsciously, on one occasion, an artful tango, is also in keeping with that highly glamourised era. But there her similarity to any other circus performer ends, for Aurelia’s is a surreal, but charmingly everyday world of petty inconveniences, spur of the moment encounters, objects inexplicably springing to life and endless opportunities to create beautifully engaging illusions designed to transfix her audiences. Its overall feeling’s like that of being young and in love and not noticing any obstacles to happiness – a vibe we could all do with these days! This magical realism is achieved through Aurelia’s abilities for sublimely seamless contortion, more like steam-lined dance, her great comedic timing, and now that she has truly come of age, a refined performance with an air of glamour. After all, how many performers could slip, fish like through walls in a full length evening gown, and seamlessly emerge unruffled, as if strolling casually through a doorway? Her two intermittent male partners lend applause drawing support, with Magnus Jakobsson taking prat fall after prat fall, only to rebound with a smile, and Jaime Martinez drawing Aurelia smoothly around the floor before slipping through into some contortion like, gracefully balanced movements of his own. The pair fairly swim through their romantic routines, and I’m sure Aurelia’s people (now she’s become a true star) will correct me if I’m wrong in surmising that this agile young man is, in real life, her husband. I could say that Murmurs is circus, squared, but that’d be taking the easy way out, which wouldn’t be in keeping with Aurelia’s style. Suffice it to say that like its title suggests, this show is an entrancing sea of contradictions, intrigue and romance, a truly mystifying and reinvigorating case of Cupid meets psyche.